The Walt Disney Family Museum opened its doors on October 1st, 2009 in San Francisco in a building that offers a breathtaking panoramic view of the magnificent Golden Gate Bridge. 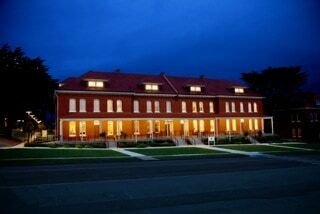 The Walt Disney Family Museum is located in San Francisco for several reasons: Walt’s remaining family resides there, San Francisco is the center of animation, the museum needed to be a destination trip rather than a side trip if it had been closer to Disneyland, and they wanted to separate Disney the man from the company. The Walt Disney Family Museum was our last stop for our Disney/Pixar event; the museum is such a beautiful and loving tribute to one man whose legacy lives on through theme parks, timeless films, and the technology that he gave us so that we could further expand the animated film industry. There is a wealth of information on every aspect of Walt’s life from his humble beginnings in Chicago to how he began his animation career to his death. The best moments of Walt’s life are immortalized, as well as some of the darker moments, such as when his animators went on strike over what they deemed unfair wages. The Walt Disney Family Museum contains 10 galleries of artifacts from Walt’s life, including: Walt’s earliest sketches and animation, awards that he personally won for his work (including the Oscar for Snow White and the Seven Dwarfs, which is accompanied by 7 miniature Oscars), and even personal things that belong to Walt or his wife, such as several charm bracelets and animatronics toys that were the inspiration for the audio animatronics you see today in Disneyland. There are currently no guided tours for The Walt Disney Family Museum, though they may become a possibility in the future. We were divided into 2 groups and led around the museum, and had plenty of time to go back through and explore more afterward. We couldn’t take pictures anywhere other than the lobby and the window overlooking the Golden Gate Bridge, so I committed as much of what I saw to my memory as I could. 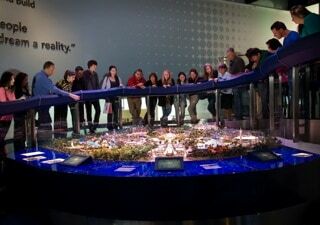 I’m briefly going to summarize the information I learned from The Walt Disney Family Museum that meant the most to me. Walt Disney was 16 years old when the war broke out. He wanted to enlist because his brothers had, but his mother didn’t want him to. He eventually joined with the Red Cross, but only after fudging his birth year. Walt left for Hollywood when he was 23 years old with his favorite jacket and $40 in his pocket. His first project was the Alice comedies, about a girl who lives in an animated world. He was told they were not popular enough, so he created Oswald the Lucky Rabbit. Eventually he parted ways with the producer of Oswald the Lucky Rabbit when the producer, Mintz, took it over. Walt vowed he would never work for anyone else again. His next character was Mickey Mouse (whose original name was Mortimer, until Walt’s wife urged him to change it). 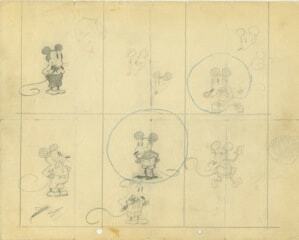 A collection of animated shorts called the Silly Symphonies were a way for Walt to test out new technology. The character of Donald Duck actually got his start in one of the Silly Symphonies shorts. Donald Duck has also been in more cartoons than Mickey Mouse has. In 1932, Walt won his first Oscar for one of the Silly Symphonies, Flowers and Trees, which was the first Disney cartoon that was in color. Walt loved gags, of which there are many in his first feature-length animated film, Snow White and the Seven Dwarfs. This was also the film where jokes couldn’t carry the entire thing, and story and characterization became important. He cut a scene that upset the animator, and to make up for it, he gave the animator the character of Jiminy Cricket to create. 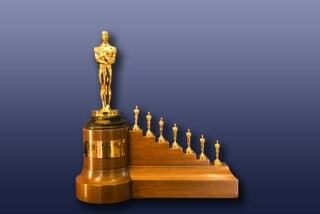 Shirley Temple presented the Oscar to Walt when he won for Snow White and the Seven Dwarfs. Walt was nominated 59 times for Oscars, and won 32 of them. Treasure Island was Walt’s first live action film. Walt got the inspiration to create his theme park while sitting on a bench in Griffith Park watching his daughters play on the merry-go-round. One of the original benches from Griffith Park is in the Walt Disney Family Museum, and could just be the very one where Walt sat. What you see in the two pictures above is the miniature model of Disneyland not as it is now or was then, but how Walt Disney wanted it to be. I have not been to Disneyland in over 12 years, and even just looking at a miniature of the greatest theme park I have ever known brought back a flood of memories and a longing to slip back into my younger self and experience everything all over again. 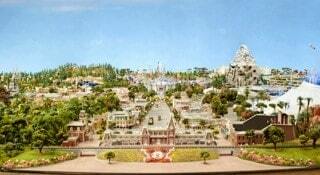 What you can’t see from these pictures is the miniature of Walt himself in the park, holding his daughter’s hand. I grew up hearing stories about Walt Disney from my father, who could see Disneyland from his backyard during his childhood. My dad played baseball with other children, and sometimes Walt Disney himself would pitch balls for those kids on his way home from work. The man himself and the works he left behind became an important part of my childhood, and I am now passing that down to my daughter, who seems to love the classic Disney films like Sleeping Beauty, Cinderella, and The Aristocats best of all. One day I hope to take her to this museum, where she can hear Walt’s voice and see black and white footage and learn all about where her favorite movies came from. This is really cool! I had no idea there was a museum dedicated to Walt Disney himself. I would love to go. My family will be touring the museum this summer, so it was nice to read about your experience there. Thank you.